Wetlands in the Lower Burdekin are under threat from altered hydrology, loss of connectivity, loss and disturbance of native species and habitat, decline in water quality, and introduction of pests. NQ Dry Tropics’ Waterways, Wetlands and Coasts team is working with key stakeholders and land managers in the region to address these issues and improve the health and function of coastal wetland ecosystems. Two particular projects are being evaluated by the NESP TWQ project 3.3.2 to quantify their effectiveness. The long-term health and resilience of the Great Barrier Reef (GBR) relies on healthy coastal wetland ecosystems. The Lower Burdekin in North Queensland has wetlands under threat from altered hydrology, loss of connectivity, loss and disturbance of native species and habitat, decline in water quality and soil chemistry, and introduction of pest species. These critical ecosystems are part of the Townsville-Burdekin wetland aggregation, a nationally-important wetland system and one of the largest clusters of wetlands on the east coast of Australia. They support commercial and recreational fisheries, host regionally significant breeding populations of waterbirds, and provide a major stopover point for migratory waterbirds on the East Asian-Australasian flyway. The region also supports significant coastal development including the important sugarcane production industry, where irrigated water is supplied to farms through a complex system of natural and artificial drainage channels. One consequence of this development is the loss of seasonality in the coastal wetland ecosystems flowing into the GBR via the Ramsar wetlands of Bowling Green Bay. The increased permanency of water in many places across the Burdekin floodplain has subsequently increased the prevalence of invasive aquatic weeds – which further reduces habitat and water quality conditions for wetland species. The NQ Dry Tropics Waterways, Wetlands and Coasts team is working with key stakeholders and land managers in the Lower Burdekin to address these issues and improve the health and function of coastal wetland ecosystems. 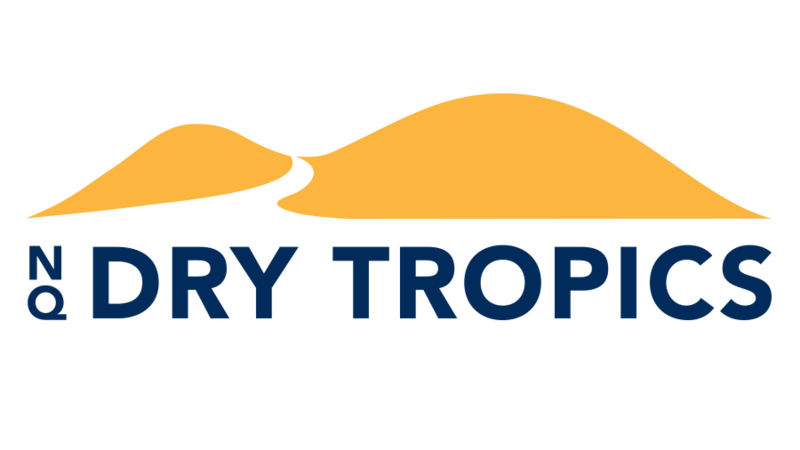 Our projects are aligned with the revised Burdekin Water Quality Improvement Plan and the Burdekin Dry Tropics Natural Resource Management Plan. They contribute towards the key water quality actions in the Reef 2050 and Reef Water Quality Protection Plan 2013, including reducing nutrients entering the GBR and improving the ecological processes and environmental values of natural wetlands. For example, the Systems Repair project is a collaboration between NQ Dry Tropics, Lower Burdekin Water and the Burdekin Shire Council. Funded under the Australian Government’s Reef Programme, this five-year project aims to strategically restore ecological function to priority wetlands and waterways within Lower Burdekin Water’s operational area. It is has been working to reduce excess irrigation flows into the wetlands within the Lilliesmere sub-catchment, allowing them to dry out seasonally, which helps control invasive aquatic plant species and restores connectivity for migrating fish. 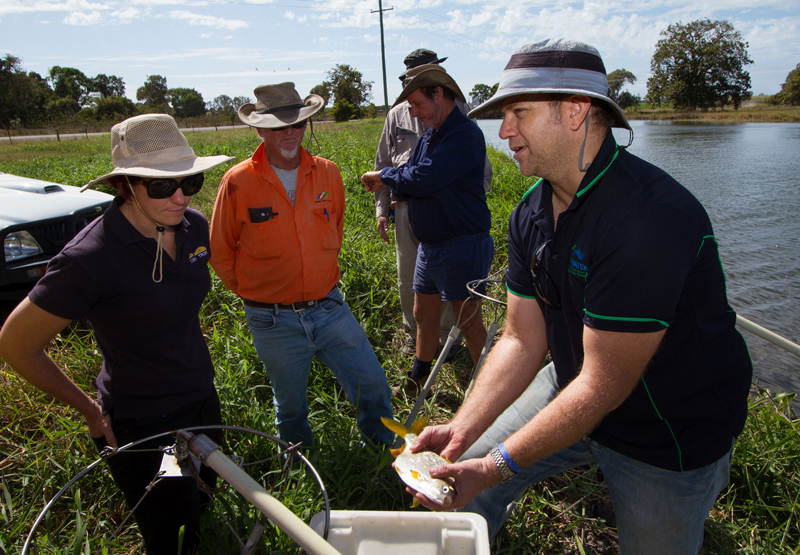 TropWATER Scientist Dr Nathan Waltham showing stakeholders a fish sampled by electrofishing in a wetland in the Lower Burdekin Floodplain July 2015 Photo Credit: Stephen Zozaya. The Connecting Burdekin Cane Farmers To Their Local Wetlands project is a collaboration with Burdekin Bowen Integrated Floodplain Management Advisory Committee Inc. that combines on-farm water quality and quantity monitoring with extension and wetland monitoring. Funded under the Department of Environment and Heritage Protection’s Reef Water Quality Science Program, the project is based at two demonstration sites: Horseshoe Lagoon (in the Burdekin River Irrigation Area) and Lilliesmere Lagoon (in the Burdekin Delta Area). It provides cane farmers with free on and off-farm data in real time, information about these results, and support from project staff and agronomists to make changes to benefit both their bottom line and improving local wetland health. Both projects are being evaluated by the NESP Project 3.3.2, (Science Evaluation Of Coastal Wetland Systems Repair Projects Across GBR Catchments), to quantify wetland health and water quality outcomes. This will fill an important research gap by evaluating the success of these projects with quantifiable data, which will help to guide future investment in the area.